Solder wick, coffee, and paper towels keep SparkFun running. You can steal someone's diagonal cutters for a minute, but you'd better ask before touching their solder wick. 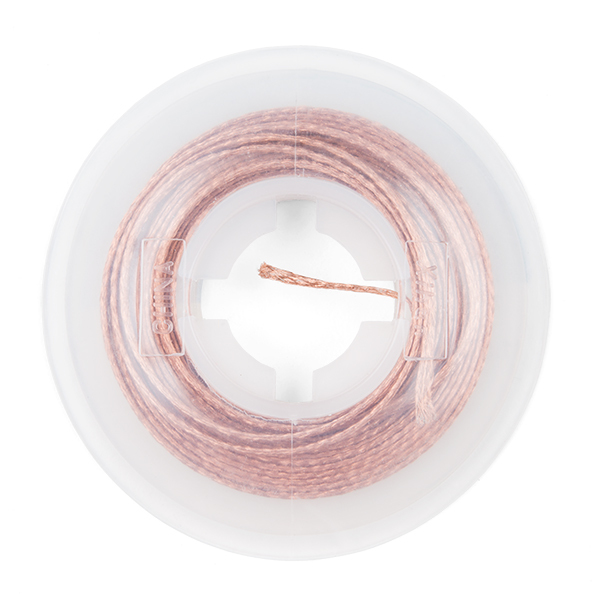 Solder wick is composed of copper threads braided together. Flux is normally added to help the solder flow from where it is not supposed to be (the jumper) to the wick. 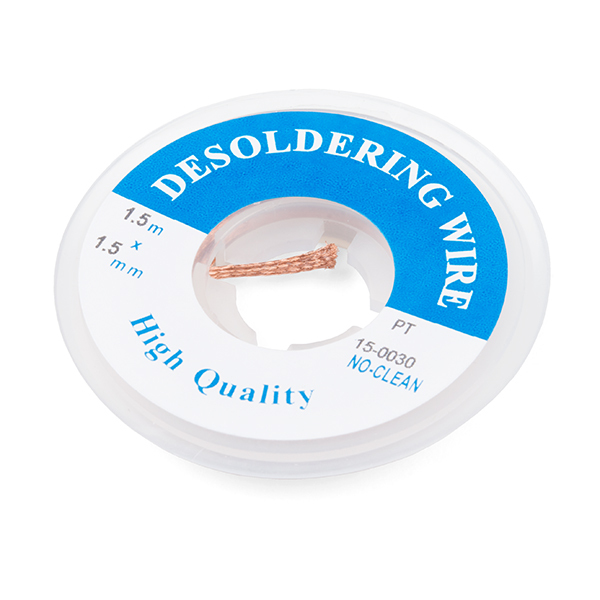 Hence, solder wick is sometimes called desolder braid. Yes, you really can solder anything, and solder wick is a large part of the process. I've never used the more expensive stuff on here, but this stuff works great. I'm definitely buying more. If you're like me and didn't think you would use this stuff, you're wrong. I completely agree, I thought that I would probably never use this, but since I heard so much I got a role. This stuff is amazing, I accidentally put a good glob of solder on the the connector and took the solder wick and with some heat on the glob from the soldering iron, it was gone. Saved by the wick. For whatever it's worth, it may not be as cheap, but the TechSpray wick you sell is 100% made right here in the US. I live in Amarillo, TX and have walked through their wick production line. They have a long machine that braids it and draws it down. It's fluxed and put onto these huge spools with thousands of feet of wick on them. There is a lady who sits there and hand winds each of the small quantity spools. They even do their own labels. As a hobbyist, at least sometimes I get to make a decision about where my parts and supplies are sourced or manufactured, so if that's important to anyone else, I wanted to point out the domestic alternative. I do like TechSpray wick, and without getting into a global economics debate, we are happy to carry two options. A brief note on the use if solder wick: It conducts heat. A lot of heat. It is generally a good idea to cut a piece an inch or two long and use that so you don't transfer heat all the way down the roll, and in the process melt part of the spool. As you may have guessed, grabbing it with you fingers during use will probably hurt a fair bit, so grab the wick with something like pliers or tweezers, or best of all, hemostats, which will hold your wick nice and steady so you just have to think about the work. This stuff worked really well for me when I assembled my first custom PCB. +1! Completely pointless. Am I missing something here, am I supposed to spread the wick part? It's not working for me. 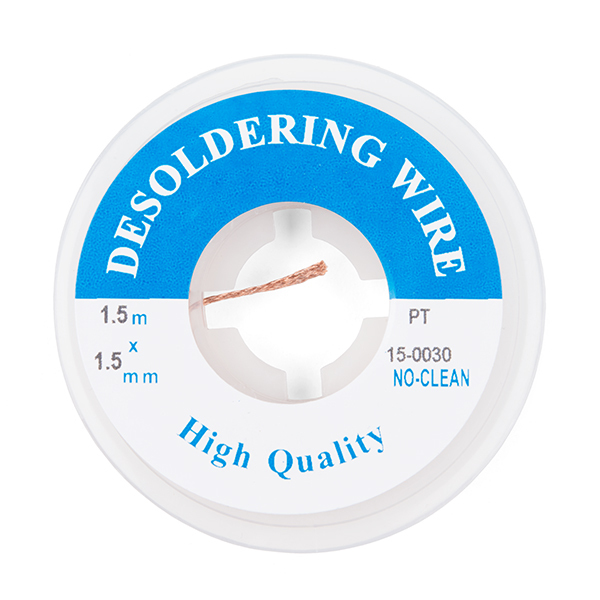 Have you tried looking at youtube videos of how to use solder wick? If it still doesn't work after trying the techniques in the videos, I wonder if this solder wick doesn't have flux on it (the description is vague, it says flux is "normally" added). this wick was more then i needed when i attempted soldering a smd kit for the first time. Surprisingly i'm still using the same roll i got years ago. Its just perfect! beats most if not all wicks i can find locally! I don't know. I usually buy my solder by the lb and solder wick in units of 100ft. I'm not doing production, but these are supplies that last forever with no expiration date. I'd rather buy a 10 year supply than a 1 year supply and there's usually a discount for the bulk amounts, imho. If you get the longer lengths, I'd be inclined to purchase them. Purchased to have some extra on hand. Works like a champ, and the price is right. Sorry to bring bad news to the table ... when I was a kid learning to solder, my uncle gave me some crappy wick. The experience left me doubting whether this hobby was a good fit for me or not. This is just as bad. Seriously, if SparkFun is trying to enable a young generation of makers, and I believe they are, then please do not ever restock this item. Hi, Some tricks to getting the most out of your wick is to spread out the braided mesh. The wider spread will allow the heat to pull the solder up and out of your joint and into the wick better. Also, cut off the tip, and only use the end. As you fill the end up with solder, cut that off, and start with some more fresh wick. It's actually not too bad of wick. We use this in our Tech Support work bench all the time. This beats most if not all the cheap wicks ive tried over the years and i take it anywhere where i might have to solder SMD components.Its cheap, does its job nicely and comes with enough to last up to a year if you only solder now and then. This may not be the best stuff out there, but for most purposes it saves me huge pains. If you've never used any before, then you can't go wrong with this stuff.